The federal state of Lower Austria awarded its prizes for innovation on Thursday, January 17. 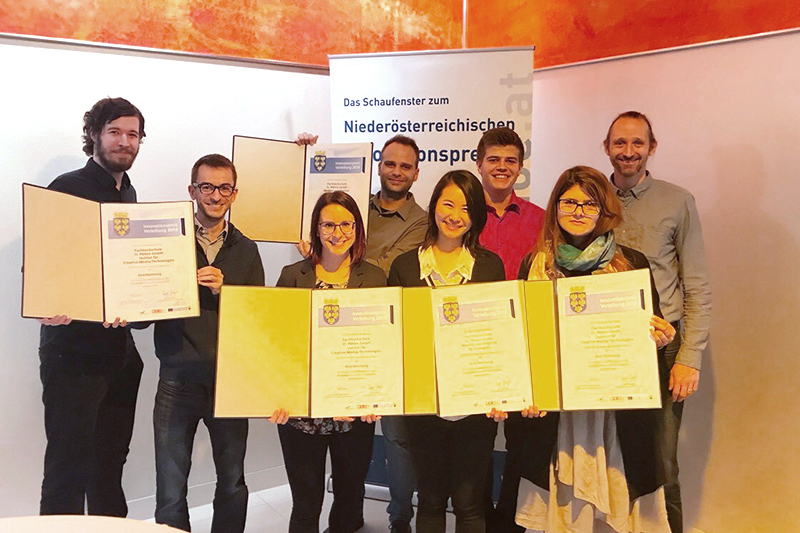 Five recognition awards went to research projects from the field of digitalisation of the St. Pölten University of Applied Sciences. These projects deal with privacy on the Internet, artificial intelligence, Industry 4.0 and data journalism. Digitalisation is gradually finding its way into almost all areas of life – from personal communication to industrial production. New procedures make it possible to derive better findings from large data volumes, with questions of privacy and IT security always playing an important role. Five research projects of the St. Pölten UAS dealing with aspects of digitalisation were honoured with recognition awards at the NÖ Innovation Awards this year. “The fact that so many of our projects were successful shows that our research is cutting-edge and meets the highest standards. Congratulations to all our researchers”, says St. Pölten UAS Executive Director Gabriela Fernandes. Data journalism extracts complex information from a vast amount of data and presents this information clearly. However, suitable methods of analysis and the right technology for this difficult task are often lacking. The research project “VALiD – Visual Analytics in Data-Driven Journalism” develops new technologies that support journalists in this challenge. By using ultrasound, audiotracking allows mobile phones and tablets to secretly track the behaviour of their users – such as the videos they watch or the rooms and places they stay in. The project SoniControl has developed the first acoustic firewall, which makes it possible to block acoustic tracking. It is available for free download under the same name on the Google Play store. ImmoAge, a joint project of the St. Pölten UAS and the Kufstein University of Applied Sciences, develops methods using artificial intelligence in order to automatically assess the year of construction, the construction period and regional building methods of single-family homes by means of image analysis. The project’s aim is the automatic extraction of building characteristics on the basis of exterior views. This is supposed to make it possible to automatically determine real estate prices in future. In its project PixelVR, the St. Pölten UAS – in cooperation with office furniture manufacturer bene – works on how to make it possible to furnish office rooms with flexible furniture elements of the company by using virtual reality. In order to see the outcome beforehand, the researchers at the St. Pölten UAS are developing an application for virtual reality glasses that give the user the freedom to playfully place the individual elements in the virtual room as they wish. Big companies and factory halls often have many thousands of containers, intermediate products and workpieces for production constantly on the move. It is important to know the current location of these items but they are sometimes hard to track. In its project GF+ Asset Tracking, a subproject of the Lower Austrian digitalisation project Enterprise 4.0, the St. Pölten UAS tests on behalf of Georg Fischer Fittings GmbH how Bluetooth Low Energy can be used for tracking containers and parts. The project is financed by the Austrian Ministry for Transport, Innovation and Technology (BMVIT) under the initiative “ICT of the future” of the Austrian Research Promotion Agency (FFG). Partners in the project are the University of Vienna (Department of Computer Science, Visualisation and Data Analysis research group, VDA); Landsiedl, Popper OG – drahtwarenhandlung film & animation; and the Joanneum University of Applied Sciences (Institute for Journalism and Public Relations, PR). The project was subsidised by the initiative netidee. The support programme is organised and financed by the non-profit Internet Foundation Austria (IPA). The project ImmoAge is subsidised within the framework of the BRIDGE programme of the Austrian Ministry for Transport, Innovation and Technology (BMVIT). Project partners are the Kufstein University of Applied Sciences and Sprengnetter Austria. This project is carried out within the scope of the ecoplus project Enterprise 4.0 and subsidised by the federal state of Lower Austria. The partner in this project is office furniture manufacturer bene. The project is carried out within the framework of the ecoplus project Enterprise 4.0 and subsidised by the federal state of Lower Austria. The project partner is Georg Fischer Fittings GmbH, a manufacturer of malleable cast iron fittings. The innovation prize of the federal state of Lower Austria is awarded to outstanding innovative projects by Lower Austrian companies as well as innovative developments of research institutions every year. The awards are organised by the Technology and Innovation Partners (TIP), the joint innovation service of the federal state and the Lower Austrian Federal Economic Chamber, and supported by EVN and Raiffeisen Landesbank Lower Austria/Vienna.